Hi everyone! How’s it going? It’s been *cough* a while *cough* since I’ve posted, and I’m in no way promising that I will be updating regularly, because I know better. If you want more regular peeks into my life, you can find me on instagram as @playcrafts. But I thought I’d post a bit about what’s been going on in the last year or so. Photo by: Mistercontributer [CC BY-SA 3.0 (https://creativecommons.org/licenses/by-sa/3.0)], from Wikimedia Commons. Life: We’ve moved. Again. Hopefully this is the last big move in a while. 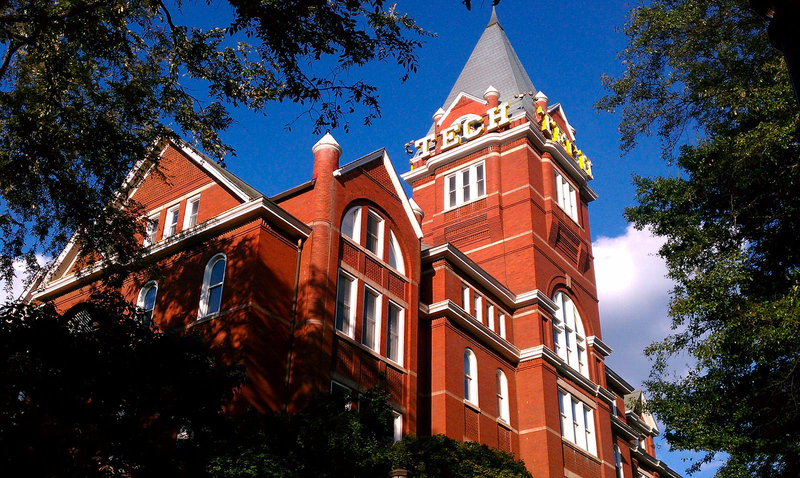 We’re now in Atlanta, GA and I’m an assistant professor of digital media at Georgia Tech. I really enjoyed the people I worked with at UCF (where I was in Orlando), and it was very hard to say goodbye. But GT is a better fit for the research I do, and so far it has been wonderful working here. We live in midtown Atlanta, which has been a big adjustment for me, I’m a rural kinda gal. But a 10 minute walk to work is the commute I’ve dreamed of, so we’re giving it a shot. We did have to downsize radically which means sewing space is at a premium and I’m really feeling the loss of design wall space. There’s been a lot in our private lives that has been hitting my sewjo pretty hard. We had our house broken into and I lost my laptop with all my photos and quilt patterns I’d created up until that point. Some of it was backed up on dropbox, but much of it wasn’t. Now everything is, but a bit too late. The also stole my DSLR camera, which I used for all my quilt photos. Health wise, I started having gall bladder attacks and in the end had to have my gall bladder removed. Fortunately, this is a fairly simple procedure as surgery goes. In harder news, we lost our dog, Mishka after a very long drawn out series of medical issues, and then 6 months later we lost our cat Kita who had been with me for 17 years. Overall, it’s been a tough year or so. Kaylee is the silver torbie in the back, Zoe is the brown tabby in the front. But it’s not all sadness! 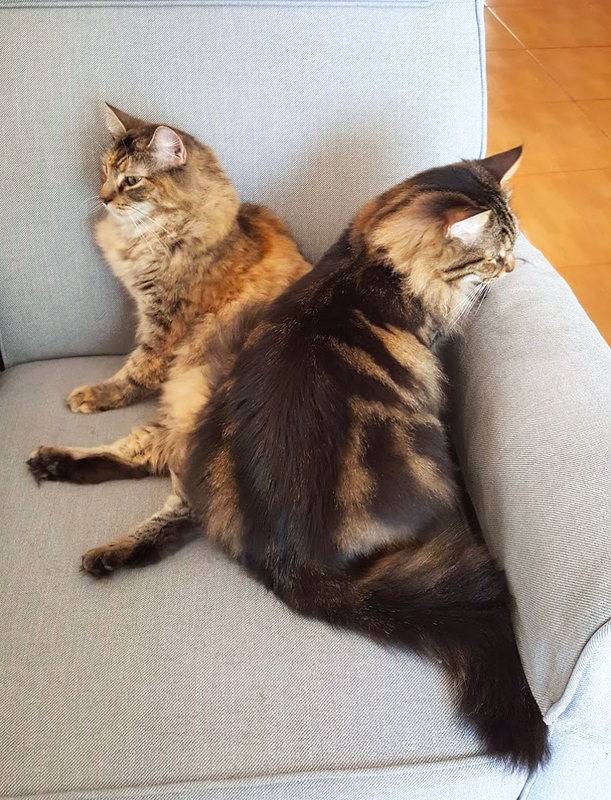 We adopted two cats, AKA the Fluffy DorkButt Duo: Kaylee and Zoe. The shelter told us that Kaylee (the lighter colored one) was 3 and Zoe (the darker colored one) was 2. Well, Kaylee turned out to be a kitten that was on her way to being a very large cat, and Zoe is “8+” according to the vet. But they’re entertaining and we’re happy to have them in our lives! They take overseeing the sewing VERY seriously. Creativity: There’s been a lot great stuff happening on the creativity front, although not a lot of actual sewing. I have a hand sewing project that I designed, and it started me down the path towards creating WPAP-inspired designs. 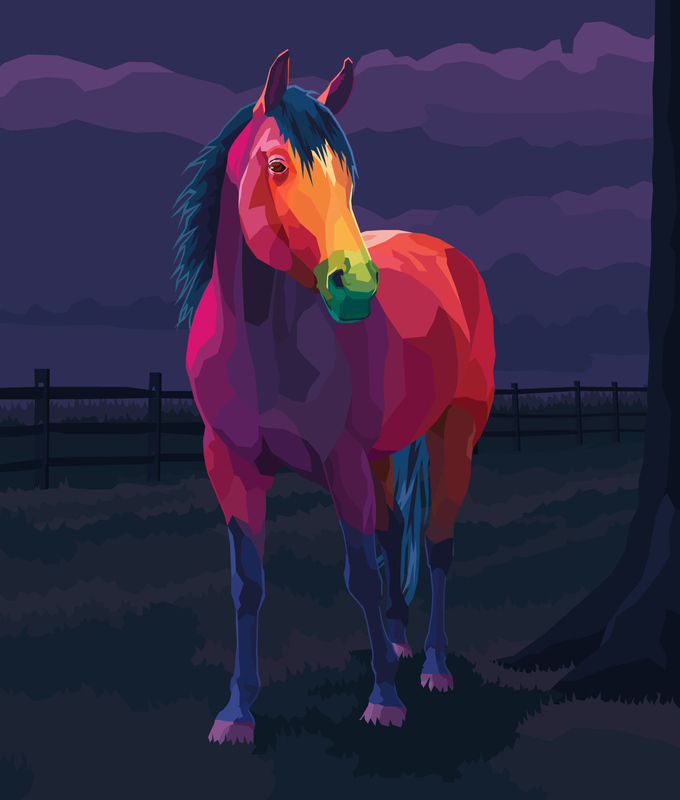 Given my love of animals, I’ve been creating a series I call Technicolor Menagerie. These are digital illustrations designed in Illustrator. Above are just two examples, I have quite a few animals now. 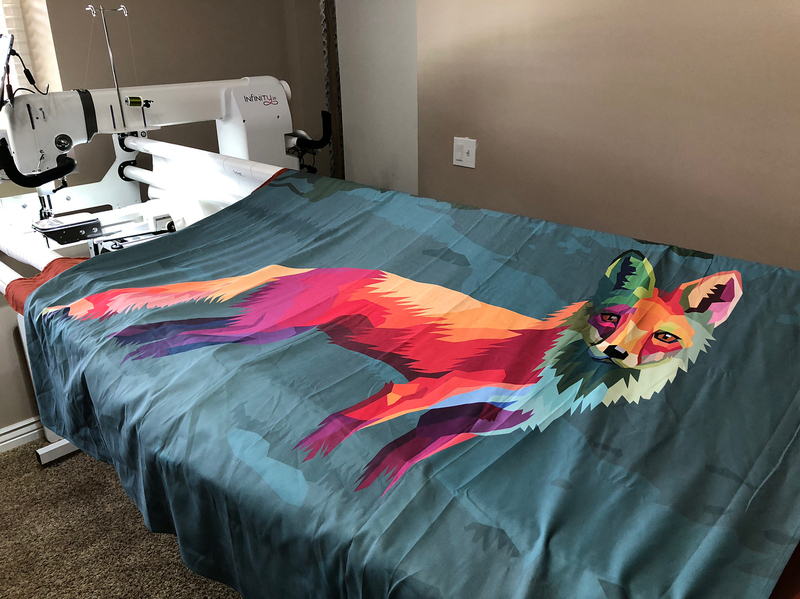 Photo by Karlee Porter – my fox design custom printed on fabric before being quilted. I’ve been fortunate in that Honest Fabrics, a new custom-printed wholecloth company (headed by Karlee Porter) has picked up the series and they are available as wholecloth designs! They’re also available on t-shirts if that’s more your thing. 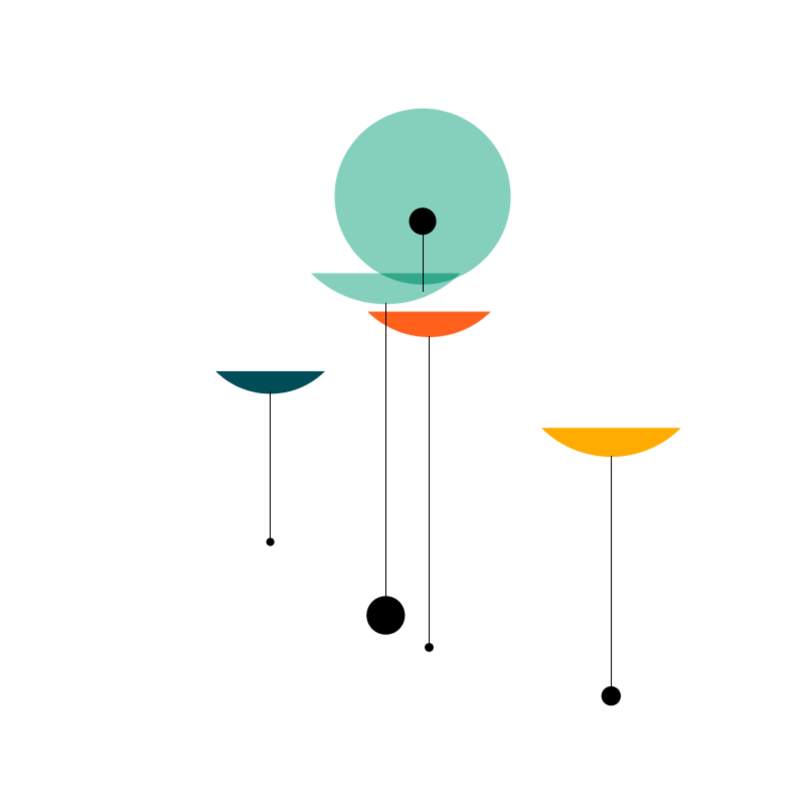 I’ve also been diving into generative art, mostly focusing on design. Some of it is heading towards quilt design and quilting design generation, but a lot of it is just for play. Two blocks for #beesewcial. Left – theme was “eyes” using blues and greens, right was “maximalist” with any saturated color except pink. And I HAVE been sewing, just not as much as I used to be able to when sewing was my main job. This is my last year (for now) as a member of #beesewcial. I’m stepping out next year to focus on finishing up some older projects. 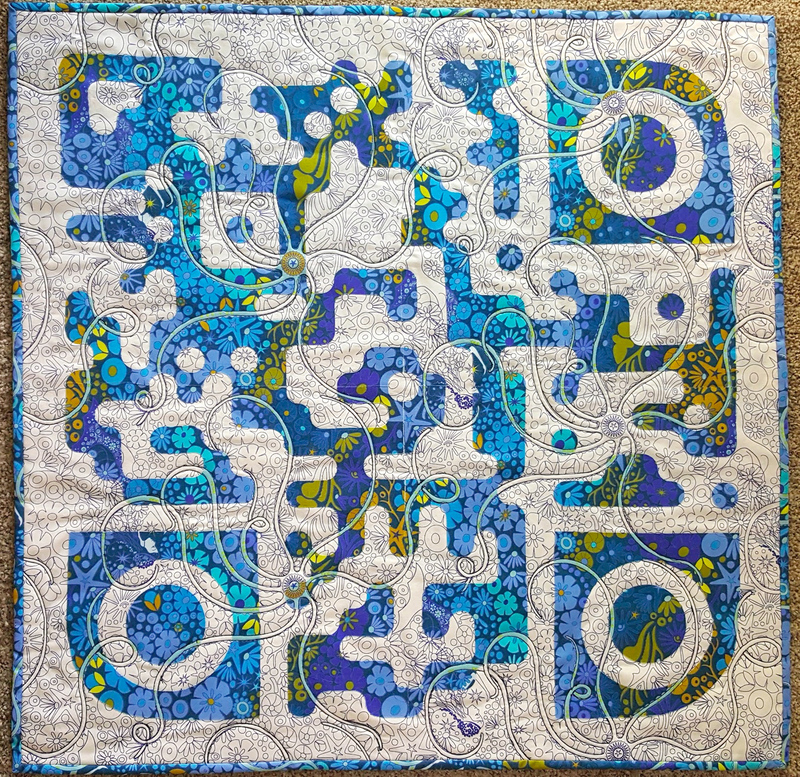 But I’ve really enjoyed the group and I love how inspiring it’s been and how much it’s completely changed the way I quilt. Quilt top that I am looking forward to quilting. I have a few quilt tops that I’ve been working on that I hope to finish up, but like all the things, I’m a bit behind. And I’ve created a few smaller quilts. 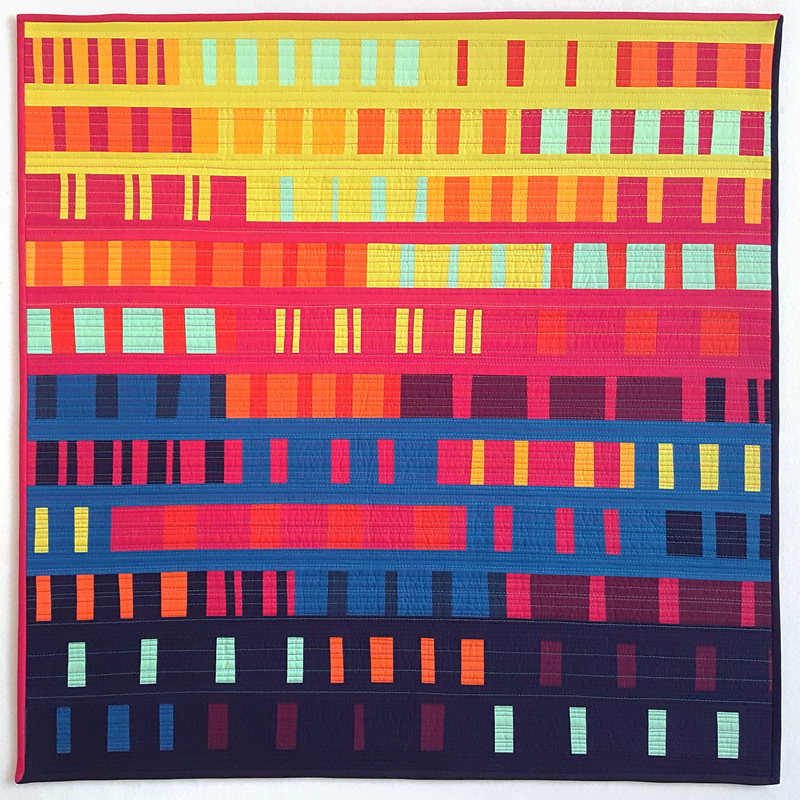 Reflections won 2nd place at QuiltCon small quilts this year, which I was absolutely thrilled about! And if you have PBS or are a MQG member, I’m on Fresh Quilting Season 2, episode 4 describing the design process behind it in a segment called Design As You Go. Daniela (L) holding the quilt I made for her, and I’m holding the one she made for me. I also created a mini-quilt for the QuiltCon mini swap. 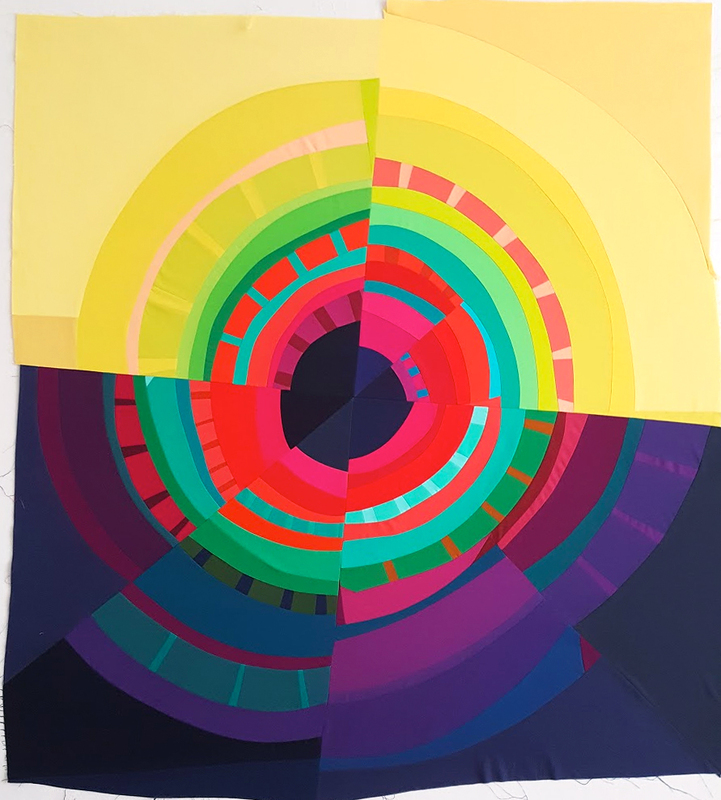 I was partnered with the incredible Daniela from Block M Quilts. We had not planned for our minis to coordinate, but they certainly did! I’m holding the one she made for me (on the right), and she’s holding the one I made for her (on the left). I adore the quilt she made for me, it’s perfect! I also created a couple of QR quilts for an academic exhibition at the Electronic Literature Organization conference this year. Yes I had far too much fun lining up the fabrics on this. I have a dream of giving each of these their own blog post at some point, but I make no promises. Also, this February, I’ll be at QuiltCon again, so I hope to see some of you there! I have the extreme pleasure (and somewhat overwhelming responsibility) of being one of the three judges for the show! I don’t choose what gets in, but we get to leave comments about every quilt and then somehow try to choose the winners. There’s loads more going on, but really this is long enough and it’s starting to feel like a holiday newsletter. I miss connecting with y’all through the blog. I hope you’ve all been doing well, and please feel free to come find me on Instagram! 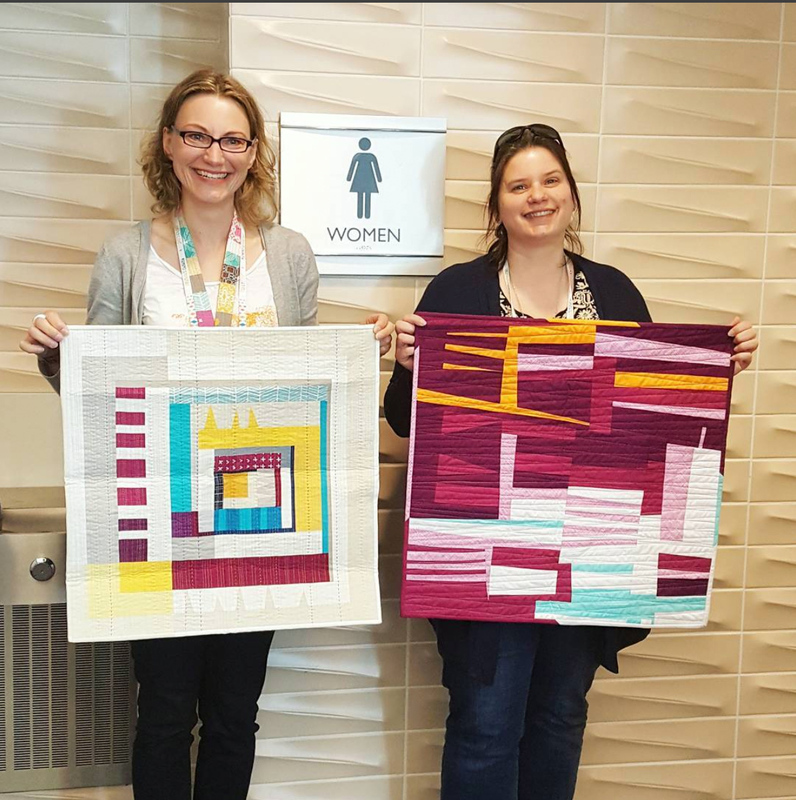 Congratulations on judging QuiltCon! I won’t be there as Nashville is too far from San Francisco for me. 2018 was not a great year for us either. I really hope 2019 will better for all of us. Take care and thanks for the update! Thank you! 😀 I’m sad to hear you won’t be headed to QuiltCon this year, but that IS a long flight. Do you think you may go in 2020 when it’s in Austin? Anne – great to hear from you. And I love your Firefly kitties! 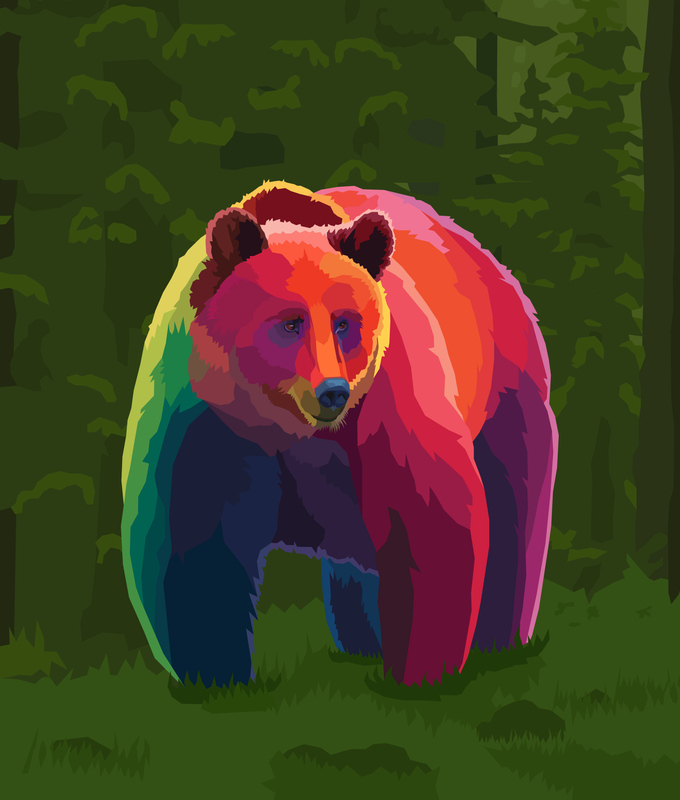 And the technicolor animals!! Oh gosh, now I have to go check out Honest Fabrics. I’ve only used Spoonflower. I have too many damn projects already, and a half dozen more crammed in my head, so really can’t afford to fit anything new in the queue. But I love the art. Happy holidays to you and yours. Hah! I’m glad someone caught the name references. 😀 They fit the personalities of those characters really well! So good to see you in my In Box! Where to begin? There’s a lot of great places to eat in Midtown, so there’s that. And Atlanta has many interesting, soothing little parks and historical places tucked away in neighborhoods that are fun to happen upon when you’re out for a walk, so I hope you’ll enjoy that part of life there. I’m so sorry to hear about Mishka and Kita. We had a year of great losses that left us reeling and heartbroken, and we found that having others to care for really was a balm. Your Zoe and Kaylee sound like they were good additions to the family. That is exactly how my blog operates for me. If I don’t write down what I was thinking, then it gets lost in the mists of time. I have found it to be an important source of information. Oh it was good to ‘see’ you and your work here. Will sure miss you in Bee Sewcial next year! Congratulations on being a QuiltCon judge. And thanks for all you shared with us at OMQG while you were in Orlando. You were appreciated. Your technicolor Mebagerie has been fun to watch as you add new animals. I have the owl t-shirt waiting to go to my husband for Christmas – I can see it better if he wears it than if I do. Good luck in everything in Atlanta. Thank you, Mary! I really do miss OMQG. Y’all were great about making me feel welcome! You do life updates so well – the holiday newsletter reference made me smile. Keep an eye out for your eyes block because I’ll be finishing the top in 2019. See you in Nashville!